The mute helps to lower the volume and alter the tonal quality of the trumpet, allowing you to warm up quietly and practice silently at home, no worry about disturbing your neighbors, family members or pets. A must have for many trumpet players. 1. 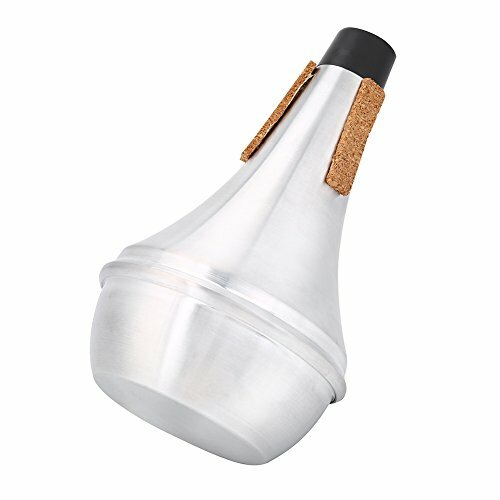 ALUMINIUM ALLOY MATERIAL: Made of aluminum alloy, this trumpet mute can produce a distinct, muted sound throughout the natural range of the instrument. 2. CUT SOUNDS: The mute cuts the sound of the trumpet, making it easier to play indoors, without disturbing anyone. It helps to produce a clear mute sound at any volume and perform evenly in registers. 3. ADD MUSIC EFFECT: This trumpet mute also can add effect to music. It is a perfect mute for music lovers to practice or warm up quietly at home or before performance. 4. PERFECT ACCESSORY: Mutes can often help trumpet players blend better with their fellow instrumentalists. It is a perfect accessory to trumpet lovers. 1. The mute is installed in the bell of the horn. And you may need some adjustment to fit the mute with your trumpet. 2. It's sometimes necessary to apply moisture to the cork to hold the mute in place. CUT SOUNDS: The mute cuts the sound of the trumpet, making it easier to play indoors, without disturbing anyone. It helps to produce a clear mute sound at any volume and perform evenly in registers. ADD MUSIC EFFECT: This trumpet mute also can add effect to music. It is a perfect mute for music lovers to practice or warm up quietly at home or before performance. ALUMINIUM ALLOY MATERIAL: Made of aluminum alloy, this trumpet mute can produce a distinct, muted sound throughout the natural range of the instrument. PERFECT ACCESSORY: Mutes can often help trumpet players blend better with their fellow instrumentalists. It is a perfect accessory to trumpet lovers.